Your garbage disposal is one of the most important parts of your entire kitchen. But there comes a time when it’ll break down and stop working. Your garbage disposal is one of the most important parts of your entire kitchen. But there comes a time when it’ll break down and stop working. Your garbage disposal is one of the most important parts of your entire kitchen. But there comes a time when it’ll break down and stop working. When this happens, don’t wait to get in touch with the professionals at Master Plumbing. In the meantime, here’s what you can do to try and fix it. Try turning it on. You notice that it’s not making any noise. In that case, how can you even tell that it’s on? This is a major sign something is wrong with your garbage disposal. Keep in mind that some models are designed to run so quietly it won’t disrupt your busy life. Make sure that the disposal is actually connected. Sometimes you might need to hit the reset button, which should be easy to find since it is glowing a bright red. Then again, the problem could be due to your circuit breaker or disposal’s motor has failed. In a situation like this, don’t do anything unless you are an experienced electrician. You’ll need to have your disposal replace as soon as possible. Leaks are never good. Not only are they disgusting to see, but it could also mean your garbage disposal needs to be replaced. The leak could be coming from the flange of the sink. Or it could be worn down. Take a second look at where the connection for the dishwasher. It’s possible something went wrong there, too. 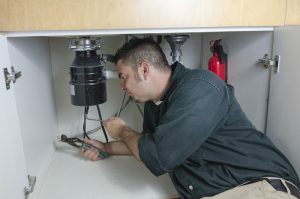 A third possibility is that your garbage disposal simply doesn’t drain. An odd humming sound signals the jam. The way to get rid of the blockage will depend on the model. Just make sure you don’t blow out the motor that controls it. Alternatively, the garbage disposal could be drain, but it’s slow. Although you might be tempted to use commercial drain cleaners, you could end up damaging your unit instead. Try the classic baking soda and vinegar method, and if that doesn’t work, then give us a call! This entry was posted on Friday, March 9th, 2018 at 4:29 am. Both comments and pings are currently closed.